38 mm 18K rose gold case set with 50 diamonds (approx. 0.7 ct) and gadroons in 18K rose gold, 9.7 mm thick, diamond bezel, white dial with luminescent hour markers in 18K rose gold set with 8 diamonds (approx. 0.05 ct.), 15P quartz movement, white rubber strap, ardillon buckle. Water resistant to 05 ATM. 38 mm 18K white gold case set with 50 diamonds (approx. 0.7 ct) and gadroons in 18K white gold, 9.7 mm thick, diamond bezel, white dial with luminescent hour markers in 18K white gold set with 8 diamonds (approx. 0.05 ct.), 15P quartz movement, white rubber strap, ardillon buckle. Water resistant to 05 ATM. 38 mm 18K rose gold case set with 50 diamonds (approx. 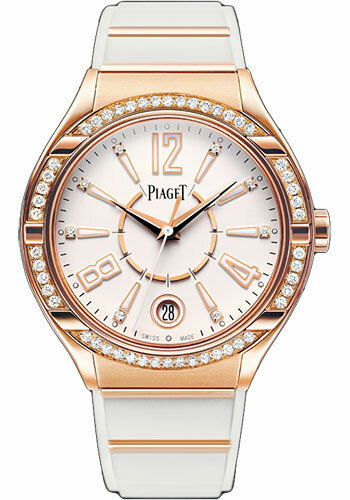 0.7 ct), 9.7 mm thick, diamond bezel, gem set dial with 18K rose gold set with 386 diamonds (approx. 1.5 ct) with hour markers in 18K rose gold, 690P quartz movement, white alligator strap, ardillon buckle. Water resistant to 03 ATM. 38 mm 18K white gold case set with 50 diamonds (approx. 0.7 ct), 9.7 mm thick, diamond bezel, gem set dial with 18K white gold set with 386 diamonds (approx. 1.5 ct) with hour markers in 18K white gold, 690P quartz movement, white alligator strap, ardillon buckle. Water resistant to 03 ATM.